Dr. Norman L. Guinasso, Jr. has been named Research Professor Emeritus, approved by the TAMU Board of Regents effective Feb 11, 2016. Dr. Guinasso began his career at Texas A&M in 1972. He has authored over 60 scientific papers and numerous reports in the areas of marine chemistry, marine geology, and physical oceanography. He has served as senior scientist or chief scientist on more than 58 cruises to the Atlantic and Pacific Oceans and European Mediterranean Sea – where he directed coring operations, hydrographic data collection, and continuous underway data collection. Dr. Guinasso served as Director of GERG (Geochemical and Environmental Research Group) from 2004 to 2010. He holds B.A. Degrees in Mathematics and Physics from San Jose State College, along with M. S. and Ph.D. Degrees in Oceanography from Texas A&M University. 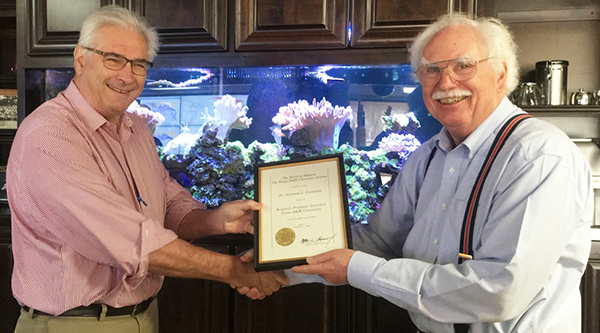 Dr. Norman L. Guinasso, Jr. (right) began his career at Texas A&M in 1972.